With this edition's Pala Presents, Larson provides a 1970 snapshot from the amazing Stewart Mine, which produced so many world-class specimens. If you didn't have a map you'd be lost. Hidden in a stand of trees off Highway 26 West, less than a half-hour west of downtown Portland, Oregon, is a little gem: The Rice Northwest Museum of Rocks and Minerals. It's home—literally—to collection around which Richard and Helen Rice built their "dream house" in gentle plains of Hillsboro in 1952. The ranch-style home itself is built of northern Arizona flagstone from quarries they visited personally. Likewise, the myrtlewood employed in the home's construction was personally logged by Richard, a logger by trade, as well as the quilted maple used in the kitchen. During an agate and mineral collecting trip to Mexico, they picked up the tile that would grace the fireplace and basement kitchen. As can be seen below, collecting in Mexico paid off, with fine specimens from the Ojuela Mine. 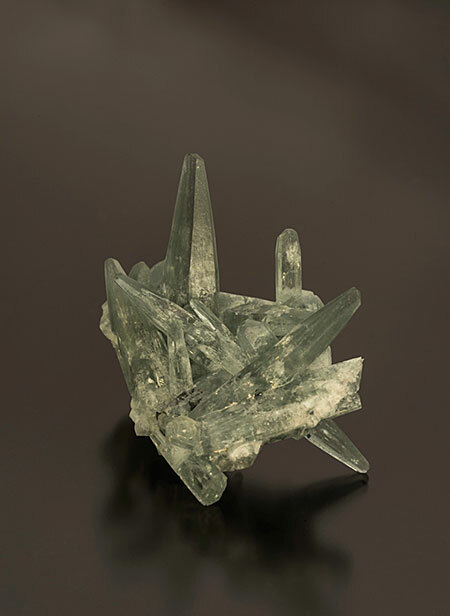 Now a museum, the centerpiece of their home remains the downstairs mineral gallery, displaying—just as it did when they lived there—a collection amassed over about sixty years, beginning in 1938. Since then, all the home's rooms have been converted to galleries, and filled with new acquisitions. Here's what museum curator Leslie G. Moclock told us when we asked about what might interest our readers. 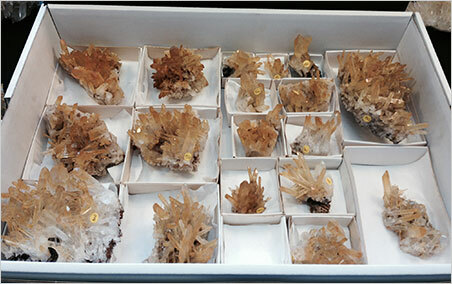 Our collection is very strong in minerals from classic Arizona localities. The Bisbee, Morenci, Inspiration, Mammoth-St. Anthony, Hilltop, Glove, Defiance, Red Cloud, and Flux mines are all well-represented. 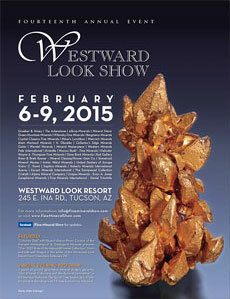 Several of our specimens were part of the "Arizona Mineral Treasures" exhibition from the 2012 Tucson show. Those specimens included malachite after azurite, two wulfenites, chrysocolla, cerussite, and azurite. 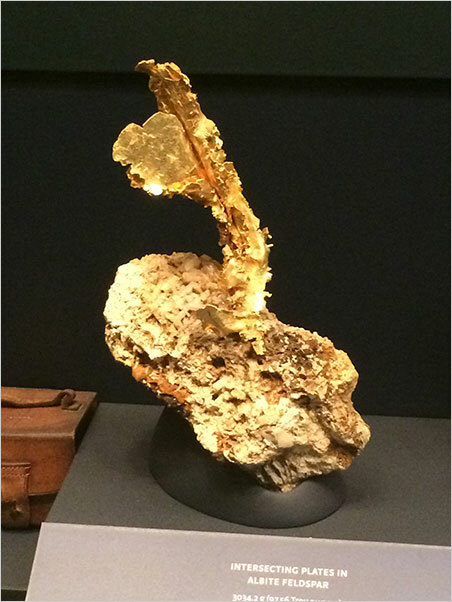 One of our Bisbee azurites was also featured as part of the "American Mineral Treasures" exhibition from the 2008 show (as were two smithsonites from the Kelly Mine). The rest of the collection includes many different minerals from all over the world. We have excellent pegmatite minerals, quartz varieties, carbonates, phosphates, sulfides, halides, and more. 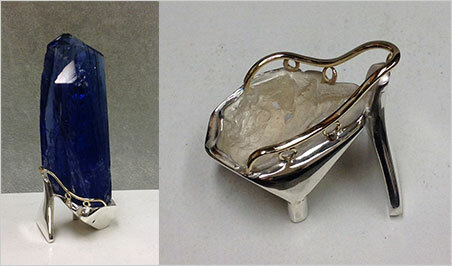 Our native elements include silver wire from Kongsberg, a large natural platinum cube, and US/Pacific Northwest gold. We also have an entire gallery outside the Master Gallery dedicated to minerals from the Northwest, including a vast display of zeolites. 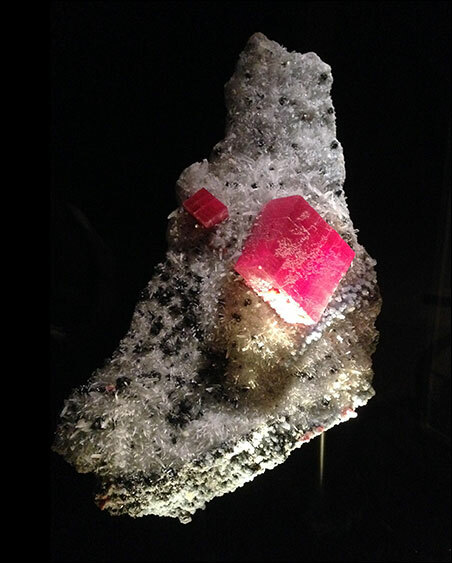 Our most spectacular carbonate, and most famous specimen on display, is the Alma Rose rhodochrosite from Colorado. If you're in the Portland area during the Holidays, take time out and give yourself an extra gift of mineral gazing at the Rice NW Museum! 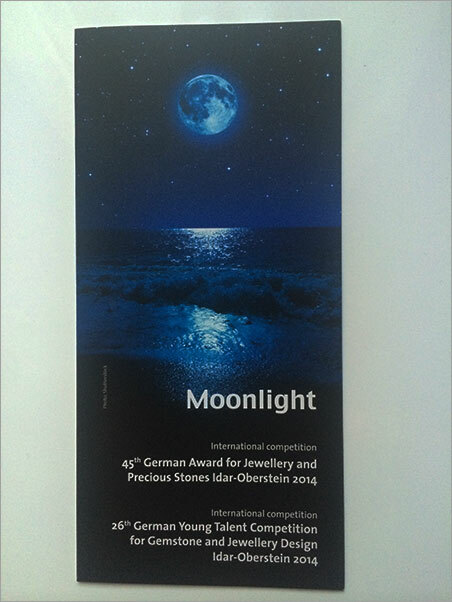 buys a single item from anonymous colliers Pakistani, Brazilian, Chinese, or he buys entire collections or parts of them, such as, for instance, the one of Titta Ruffo (son of the great singer) in 1984, initially made of 1500 pieces, among which emerged silver of Kongsberg, a chrysoberyl, many tourmalines and beryls. An important acquisition dates back to 2001: it's the collection of Gerlando Bennardo who had worked several years in the Giumentaro mine. Several of the collection's specimens are pictured on the show's website. In particular we enjoyed a multicolored elbaite from the Sapo Mine in Brazil's Minas Gerais, a snowflake-esque cerussite from Namibia's Tsumeb and a vanadinite from Morocco's Mibladen. 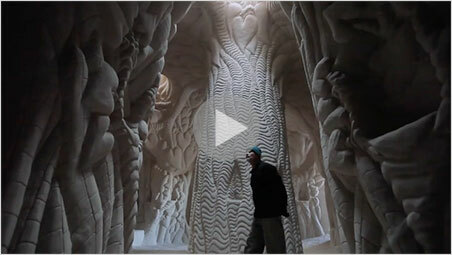 Ra Paulette is a architectural sculptor whose medium is the sandstone cliffs of northern New Mexico. His commissioned works have taken years to complete, but almost all have ended with patrons colliding with Paulette's artistic vision. Cavedigger, a documentary film short by Jeffrey Karoff that received an Oscar nomination last year, tells the story of Paulette's dilemma and solution: he's working for himself—on a ten-year project for which he has complete control. That is, when the cliffs themselves don't betray him. It's very physical work, and Paulette has entered its Tao, calling his "whole-person activity" the "dance of digging." For a profile of the artist, see the Santa Fe New Mexican. In this edition of our newsletter we feature two cabinet-specimen stocking-stuffers. 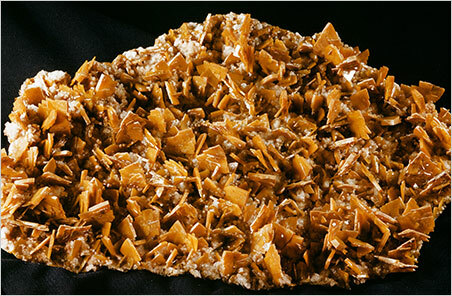 First, an anglesite from Monteponi Mine, Iglesias, Sardinia. This fine small cabinet specimen was found in the 1970s and purchased at this year's Munich Show from Pala international friend and French dealer Alain Martaud, who had received it from an Italian collection just weeks before the show. It is well terminated and lovely, featuring a light yellow color. This would be a very rare piece for any mine, but especially rare for this classic Italian locality. We also offer a fine small cabinet aquamarine matrix specimen. 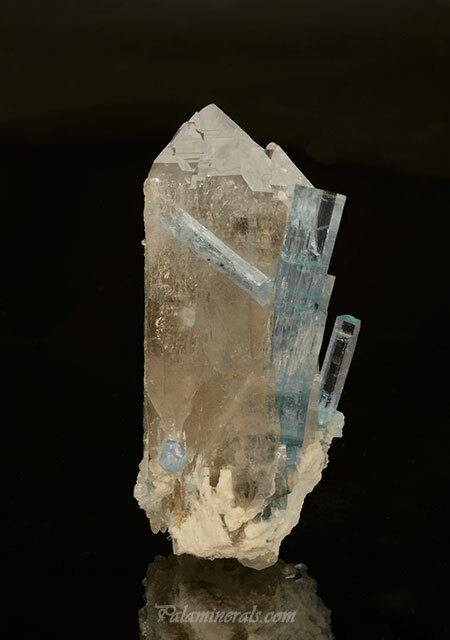 It features multiple, unrepaired, beautiful blue and gemmy aquamarine crystals on quartz crystal. Matrix is very hard to obtain from Vietnam's Thuong Xuan area near the Laos border. Pala International has good contacts from Vietnam via visits in the late 1990s and obtains specimens directly from Vietnamese miners through friends. For more on this locality, see "Aquamarine from the Thuong Xuan District, Thanh Hoa Province, Vietnam," Gems & Gemology, Vol. 47, No. 1 (Spring 2011). Star of the sea, assist your people who have fallen yet strive to rise again. Human beings have had a long time to view the moon (the nearside, that is), with or without the aid of optical aids. And they've had a lot of time to ruminate regarding the formation of its features. Take, for instance, its vast, dark, sea-like expanses. Early on, each was given a maritime moniker in Latin, e.g. (exempli gratia, heh-heh), Mare Tranquillitatis (Sea of Tranquility), Mare Crisium (Sea of Crises). One such "body" was too great to be dubbed merely mare: Oceanus Procellarum, the Ocean of Storms. Of course, these maria were not bodies of water; the Ocean of Storms was thought to have been caused by the impact of an asteroid. That is, until NASA's Gravity Recovery and Interior Laboratory (GRAIL) mission returned data that led to another conclusion. 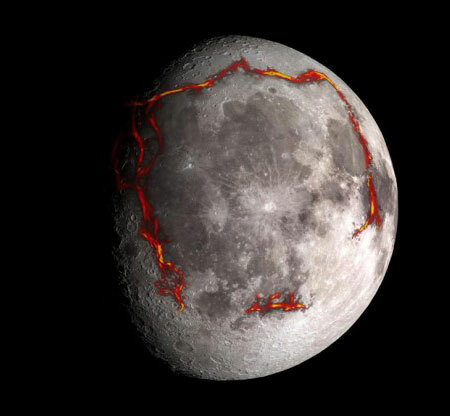 "We interpret the gravity anomalies discovered by GRAIL as part of the lunar magma plumbing system—the conduits that fed lava to the surface during ancient volcanic eruptions," said the mission's principal investigator, Maria Zuber of MIT. GRAIL co-investigator Jeff Andrews-Hanna of Colorado School of Mines said, "The rectangular pattern of gravity anomalies was completely unexpected. Using the gradients in the gravity data to reveal the rectangular pattern of anomalies, we can now clearly and completely see structures that were only hinted at by surface observations." Andrews-Hanna is the lead author of a report on the findings, published by Nature. Self-described "data geeks" College Factual has ranked Colorado School of Mines* as the top engineering college in the United States, as reported by USA Today on August 20. The school's highlighted attributes: high admission standards, a focus on responsible use of natural resources, reasonable tuition and high student outcomes. Other factoids from the College Factual website: high freshmen retention, 16:1 student-to-faculty ratio, 66% full-time teachers, 40% on-time graduation rate, 74:26 male-to-female student ratio, medium ethnic diversity and low crime. The School of Mines beat out Georgia Tech, Missouri S & T, MIT and six others in the top ten. * The School of Mines is the alma mater of Pala International President Bill Larson, having received a "silver diploma" from the school in 1967. In October, Gordon Johnson, staff writer for Riverside's Press Enterprise, wrote an article recalling how his alcoholic uncle received a wake-up call regarding his health, white-knuckling himself through recovery with the aid of what Johnson calls "tourmaline therapy." While Uncle Peanut had been out drinking with the Happy Boys of Pala, California, his mother had been lighting votives at the Pala Mission. The death from cirrhosis of a drinking partner helped Peanut straighten out. But, also, trips to the tailings of the tourmaline mines in the Pala District helped, too. 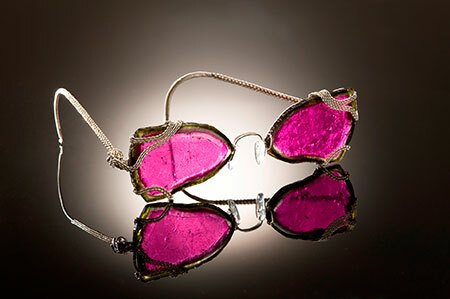 He began crafting earrings and necklaces out of what he found. 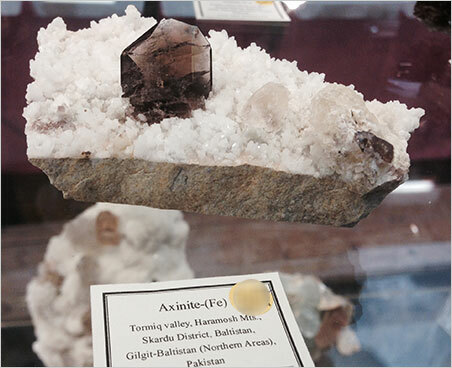 But some specimens found their way into his tourmaline exhibits at the San Diego County Fair. Eventually Peanut married, began attending church, and became director of the Boys & Girls Club. 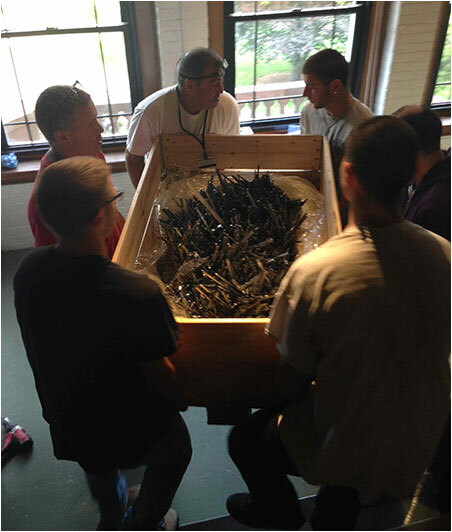 It's only fitting; as Carl Jung noted, it is the wounded who can help others heal, and in the process heal themselves. 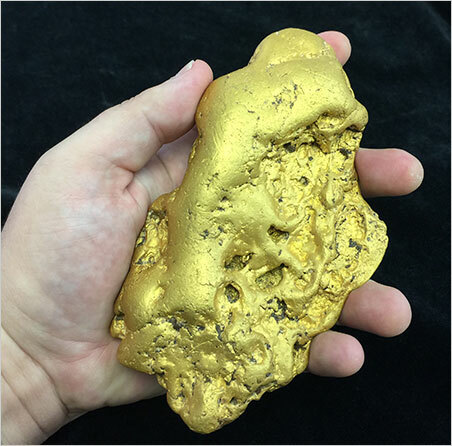 It's been decades since a 6-plus-pound gold nugget has been unearthed in California's gold region. In July, an anonymous prospector did just that, and it turned up last month at the San Francisco Fall Antiques Show, but was sold quite quickly to an anonymous buyer. The 6.07-pound "Butte Nugget" was named for the California county of its origin. The sale price was about $400,000 according to AP. A pre-sale news release by its broker, Kagin's Inc., had estimated it to sell for $350,000 to $450,000. According to the news release, Kagin's had been burned in 2010 when a 98-ounce California gold nugget turned out to be an Australian masquerader. 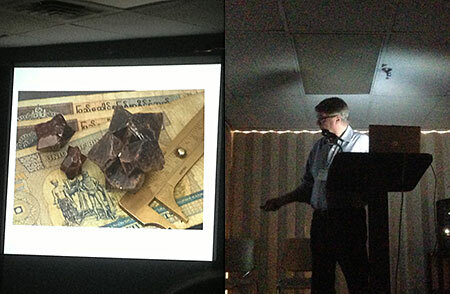 "Fortunately, the discoverer of the Butte Nugget photographed its excavation step by step," said Kagin's senior numismatist, David McCarthy. "I was able to use his pictures to positively identify the location where the gold was discovered." Kagin's also displayed gold-rush era gold coins, discovered by dog-walkers, also in California's gold country, in 2013. But those were largely ignored, according to the San Francisco Chronicle. In 2011, we teased our readers with the following photo, taken in 1969 when Pala celebrated its success with a private party assembled by Peter Bancroft. 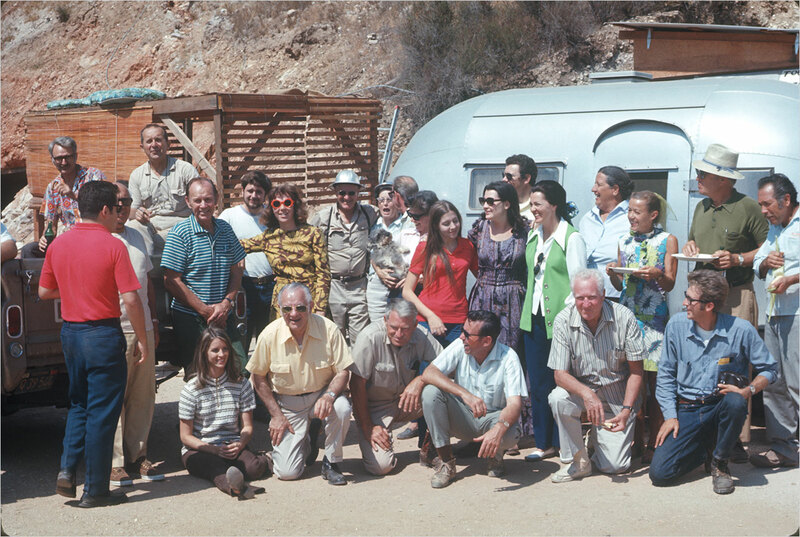 Last week, Bill dusted off a rare group photo from the inaugural Stewart Mine Bash in 1970, and has taken pains to ID as many partygoers as he can. If you recognize a straggler (or the mystery woman in red shades) please let us know. 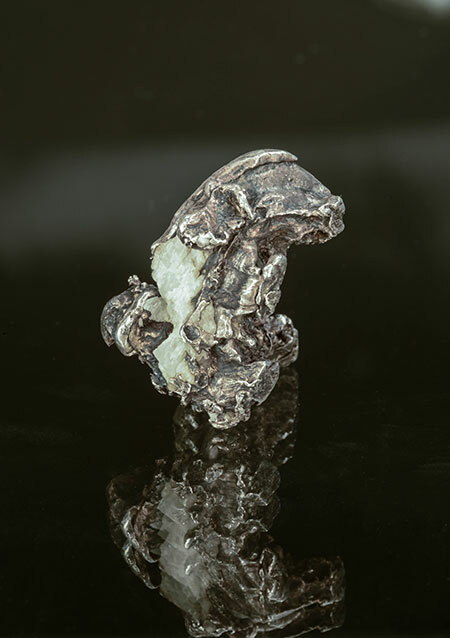 Below is a recent item from our sibling publication, Palagems Reflective Index, that will be of interest to mineral enthusiasts. It may come as a surprise to readers that, for more than a decade, the most visited museum in the world has had to foot the bill for many of its expenses. Since 2003, "the Louvre and other state museums have been required to raise money for renovations and other special projects," according to a 2006 Los Angeles Times profile of the landmark. 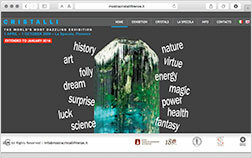 This was reflected in a recent visit to the museum's website, which is calling upon the public to fund just such a "special project" of interest to gemstone and mineral enthusiasts: the acquisition of a sort of periodic table—in the form of a four-legged, oval-shaped table. About a quarter of the required million euros has been raised for the purchase of The Teschen Table, considered the masterpiece of the court of Saxony's principal jeweler, Johann Christian Neuber (1736–1808). At the end of his career, Neuber was curator of the royal collections in Dresden's Green Vault (Grüne Gewölbe). That treasure chamber, largely destroyed during World War II, has been restored, and a new addition (Neues Grünes Gewölbe) contains a room dedicated to Neuber's work, the Neuber Raum (according to Wikipedia). 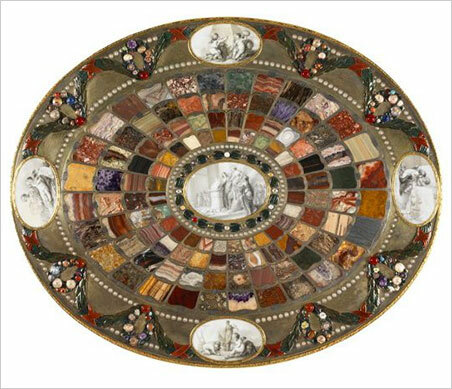 The artist (and scientist) Neuber developed a technique known as Zellenmosaic, or cells-mosaic, which he first employed in snuffboxes that featured numbered hardstones from Saxony, accompanied by explanatory booklets. (The Louvre has twelve of these Steinkabinett Tabatieren on display.) 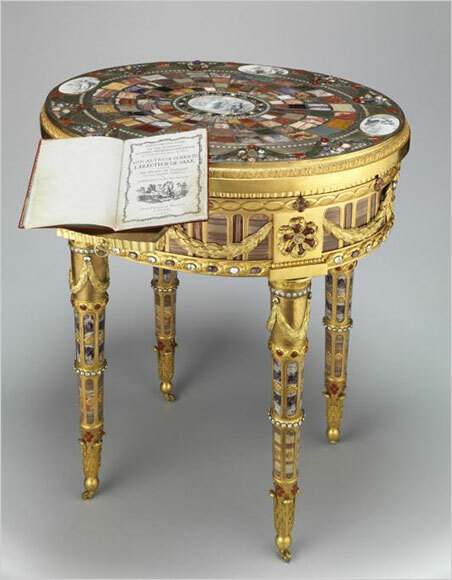 The Teschen Table is the technique writ large, with the top, apron and legs inset and adorned by 128 numbered samples of semiprecious stones of the region as well faceted stones and false pearls. It is crafted in three-color gilt bronze on a wooden core. The table was a gift to Louis XVI's ambassador to Vienna, Louis-Auguste Le Tonnelier, Baron de Breteuil, following some dicey negotiations that kept France out of the War of Bavarian Succession in the late 1770s. Commemorating the peace accord, which was signed in Teschen (then in Austrian Silesia; now divided between Poland the Czech Republic), are five Saxony porcelain medallions, painted in grisaille by Johann Eleazar Zeissig (aka Schenau). While the War is characterized by Wikipedia as a remarkable "war-without-battles," the deployment of troops took its toll, with deaths from raids, starvation and disease estimated in the tens of thousands amongst soldiers and civilians. (There may be a connection here to one of the War's popular names, Kartoffelkrieg [Potato War], since it took place during the potato harvest.) For historians, the War is considered a watershed, foreshadowing warfare to come, in terms of the huge numbers of soldiers conscripted, trained and equipped; the attendant military spending; and what would be an outmoded style of engagement, "in which armies maneuvered sedately at a distance while diplomats hustled between capitals to resolve their Majesties' differences." Reading the fascinating story of this largely forgotten, relatively minor conflict—yet involving powers like France and Russia—we are reminded of 20th and 21st century clashes, large and small. 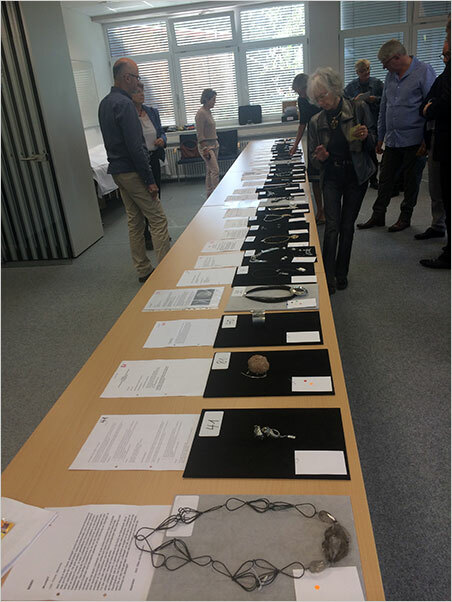 Identification of 128 pieces of precious stones and petrified wood, found in the country of his Highness […] the Elector of Saxony, composed in the form of a cabinet on a small table, and rows in the order of numbers. By Johann Christian Neuber, Dresden, 1780. The Munich Show will see the debut of a new book, Gold for Collectors, by Scott Werschky and Carles Curto i Milà with photographs by Joaquim Callén, publisher of the magazine Mineral Up, which is issuing the book. 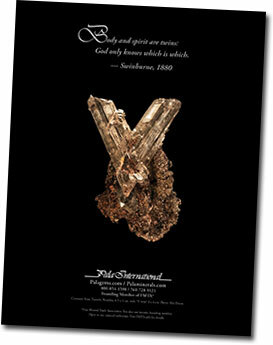 The large-format book will be limited to 2000 copies. Hundreds of images and details grace its pages. It also will feature a foreword by Pala International's Bill Larson. Just a taste. 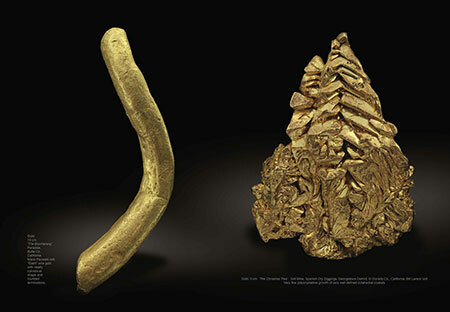 Pre-publication thumbnail image of a spread from Gold for Collectors, featuring "The Christmas Tree" at right (Grit Mine, Spanish Dry Diggings, El Dorado Co., California, Bill Larson collection) and "The Boomerang" at left (Paradise, Butte Co., California, Mario Pauwels collection). 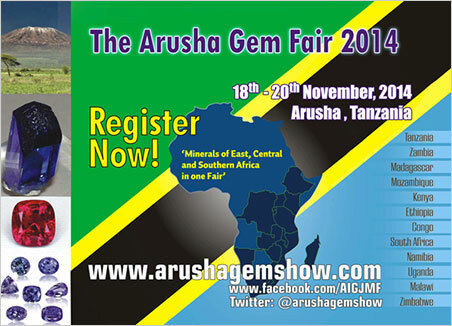 The show, according to its organizers, "brings together primary gemstone and mineral producers from Sub-Saharan African countries in one forum, along with renowned industry leaders, respected mineral collectors/dealers, lapidary seminars and demonstrations, and round-table discussions with Government Leaders and industry players from our regional African partners." The show is a more intimate affair than many. Last year's show featured only about 500 buyers, exhibitors and guests, from 29 countries. 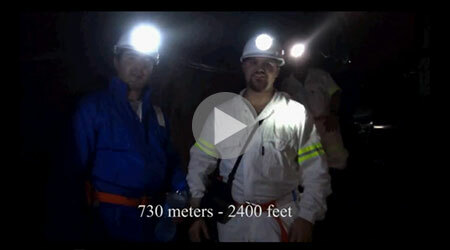 See also Will Larson’s First Voyage to Tanzania – Tanzanite – A Stone of Beauty on Pala International’s YouTube channel. Larson plumbed the depths in Merelani's Block C.
As reported by JCK on August 13, the Tanzanite Foundation—the first colored gemstone marketing firm devoted to a single stone—will close at the end of the month. The Foundation had dealt with a number of ethical and operational challenges facing the industry. It also had given back to the mining community, building two schools, a clinic, and an orphanage, and providing employment opportunities. The reason for the closure, according to JCK, is economic, in terms of the stone's current historic low price, and factors such as poor output, illegal mining operations, and theft. 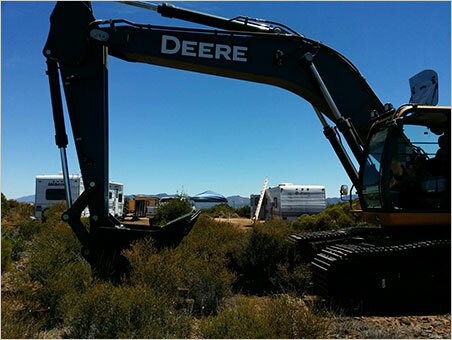 It’s been 16 months since we reported on the Mountain Lily (Ware) Mine at the northern edge of San Diego County. Development is slow when mountain-moving is involved. For instance, in July, it took days for John McLean, Ben Castillo and Casey Jones to drive the Deere (pictured above) to the bottom of the hill. Then, up the hill with lead- and trail-cars. Then the Deere literally made its own road. 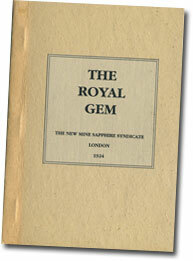 The following item came in two days after the publication of our sibling publication, Palagems Reflective Index. Rather than wait for its next edition we thought we'd share it here first. If the discussion of the gold rush(es) in Colorado below leaves you craving more about the metal, view America's Gold, a documentary from the How the Earth Was Made series available at History.com via login by your cable provider. The documentary also is available without login on YouTube. 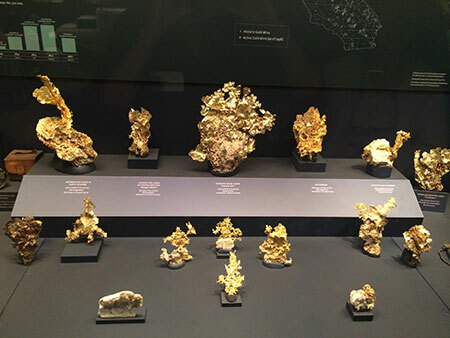 America's Gold begins by explaining how gold is widely distributed, but usually in tiny amounts, due to its dispersal along with other heavy metals via the explosion of a supernova in the distant, distant past. There are, however, particular regions of our planet that do contain "stashes" of gold. One of these, of course, is the western United States. America's Gold reminds us that the first North American gold rush, at least amongst Euro-Americans, began by happenstance, not by intentional prospecting but accidentally, by lumber production at Sutter's Mill, near Coloma, now a ghost town, northeast of Sacramento. As is customary, the documentary attributes the discovery to James W. Marshall, who at the time was building the sawmill for Swiss pioneer John Sutter. But there is an alternate account. While the mill-race was being dug, the children found it to be a place which they liked to play in, and one day, while thus playing, little John Wimmer, the second oldest boy, found a piece of gold of the value of about eight dollars. It was bright and pretty, and he ran to the house and showed it to his father [Peter Wimmer] and Marshall. It was washing day and, at Marshall's suggestion, the nugget was put into the wash-kettle among the boiling suds. After some little time it was found to be untarnished and Marshall said it must be gold, and he took it to Sutter's fort where it was tested and found to be truly gold. America's Gold provides a demonstration of panning for gold, then shows how nature does its own separation of heavy particles from light. Old river and lake deposits could be near the surface, or deep below, and viewers are taken briefly abroad, two miles underground in South Africa's Witwatersrand, so rich in gold that nation's currency was named after it. The change in terrain that can indicate gold, alluded to in John H. Gregory's story below, is illustrated in the documentary, as are scientific discoveries regarding pertinent geology. And geological characteristics are compared; for instance, those of California versus Nevada. High-tech prospecting techniques round out the documentary. The structure of America's Gold may be a little annoying for the attentive, or helpful for the distracted: in addition to post-advert recaps (the ads are omitted, but their locations are obvious), the doc inserts post-segment flashcards, in case something didn't stick. There's not much eye candy for specimen enthusiasts, but the documentary does provide an easily digestible introduction to America's gold. On September 16, Odyssey Marine Exploration, which salvages shipwrecks amongst other pursuits, announced the completion of its current phase regarding the SS Central America. The project covered 161,000 square meters of exploration and led to the recovery of more than 15,500 gold and silver coins and 45 gold bars. Also salvaged were hundreds of gold nuggets, gold dust, jewelry and other artifacts. Currently, results of the survey and recovery are being analyzed before a return to the site within the next twelve months. Terry Lee Ledford, best known for having uncovered what would be the largest cut emerald in North America, was killed on September 17 while working in Hiddenite, North Carolina. Details of Ledford's death were posted on The Rockhound Connection at Facebook by Rusty James, owner of Throwin' Stones Crystals, Minerals & Gems in Asheville. According to James, Ledford was in the mine hole when a 30-foot wall collapsed, sending perhaps ten tons of dirt and stone on top of him. * Rescuers took more than three hours to reach his body. Ledford was working in a hole that officials said was about 60 feet wide and 30 feet deep, at the edge of what appeared to be a large green field. The owner of the property, Lynn Sharpe, called 911 after noticing the collapse. A CNN profile of Ledford and the famous emerald, the "Carolina Emperor," states that the stone weighed 310 carats before being trimmed to 64.83 carats in a design inspired by a piece owned by Catherine the Great. Discovered in August of 2009, it was purchased in 2011 before being gifted along with other stones to the North Carolina Museum of Natural Sciences in Raleigh by an anonymous benefactor, as reported by the News & Observer. Ledford "always loved rocks," as he told CNN. The son of a mica miner (a Facebook comment states that an unstable mica pocket could have given way in Ledford's case), as a youngster, he ran a gem stand on weekends. In the early 2000s Ledford partnered with W. Renn Adams, an octogenarian whose family had been digging for gems since the 1880s. 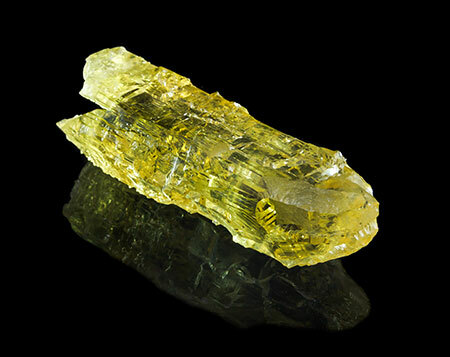 According to his obituary, Ledford also found the largest hiddenite crystal ever discovered. 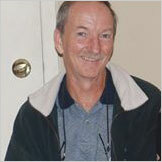 Ledford lived with his wife Cheryl in Spruce Pine, about two hours west of Hiddenite. He also is survived by his son Ryan Ledford, stepdaughter Katie Butler, and stepson Eli Macey, along with many younger relatives. *Note that in our emailed version of this newsletter we stated, in error, that Ledford was inside an excavator at the time of his death. It's not every day that you hold a 5¼-ounce piece of history in your hands. Such was our fortune at the inaugural Denver Fine Mineral Show last month, when Pala International's Bill Larson took George Hickox and your editor into the display room of Mineral Classics. 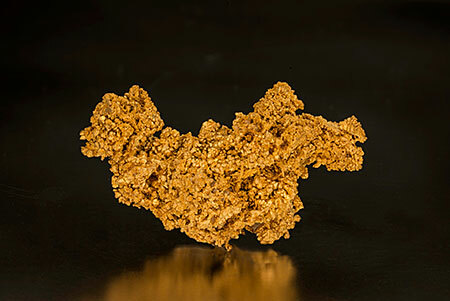 Manager Brian Kosnar and the firm's Tresa Foster unboxed for us a gold crystal group that is from the lode that famously "salvaged the Colorado gold rush," as historian Tom "Dr. Colorado" Noel put it in a profile of the lode's John Hamilton Gregory. Not only is this gold from a historic locality, but the story of it slipping through subsequent hands is, er, gripping as well. According to Tom Noel, who is professor of history at CU Denver, and Patsy Bradbury, author of a genealogical biography of John H. Gregory (1820–?1863), Gregory became something of a mystery man. Born in South Carolina, he and his family moved to Cherokee County, Georgia not long after that state's 1832 Gold Lottery, the seventh of eight distributions of Native American land since 1805. A gold rush in northern Georgia had begun in 1828, and the Gregorys were in the thick of it. (John's father Griffin was a seasoned gold miner.) According to an unnamed source quoted by Scott, prior to the California gold rush of 1848 more of the metal had been mined in Cherokee County than anywhere else in the country. 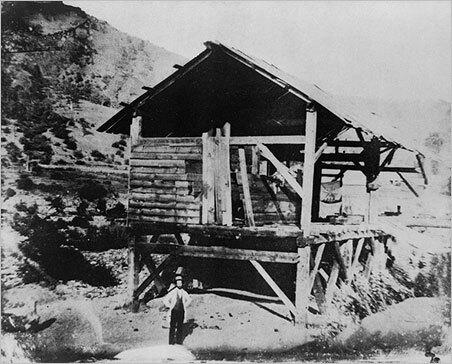 Gold production in the area declined, however, and John Gregory moved to nearby Gordon County before getting wind of the Colorado discovery of gold in 1858 by the Russell boys (also from Georgia)—precipitating that state's first, albeit short-lived gold rush. According to Noel, disappointed miners had called the 1858 strike "the Pike's Peak Hoax," and two-thirds out of the initial 100,000 returned home. While en route to Canada, Gregory heard about the Russells' find as he wintered at Fort Laramie. Seizing the opportunity, he traveled south, prospecting in the streams of the Medicine Bow and other Front Range mountains. Scott quotes Gilpin County newspaper editor Ovando Hollister as saying Gregory likely was the first white man to approach many of these streams. According to Hollister, just as Gregory noticed a change in the terrain, figuring this would turn up gold, a snowstorm hit, so strong he nearly died. Even when it waned, he was forced to return to the valley for supplies, leaving the area untouched. In Denver (then known as Auraria, named after a gold-mining settlement in Georgia), Gregory confabbed with one of the Russells, compared notes, and resolved to return to his golden gulch. But he was destitute. In May 1859, he was able to convince a party of Indiana prospectors to trade grub and transportation for Gregory's experience. Forty miles west of Denver, on May 6, he found $4 worth of gold. On May 19, Rocky Mountain News reporter William Byers was shown $1000 worth—the result of three days' effort. Soon after, perhaps before the end of the month, he'd sold his two initial claims, hiring himself out. Nevertheless, the Gregory name became something of a franchise: a Gregory diggings, three lodes, a point, and two mining companies. Through all of this Gregory remained amiable, as meanwhile, newspaper reports both allured and alerted readers to the prospects and perils of travel and travail. The area was mobbed. In 1867, according to Scott, the Gregory Lode and Diggings alone were home to at least 85 companies. Gregory spent the 1859–1860 winter months in Georgia, returning by March. Scott details his many dealings, showing Gregory to be an extremely shrewd businessman; striking and selling; building a mill, operating a while, and selling; usually in partnership with others. In October 1860 he headed back to Georgia. A year later the Russells divested themselves of their Colorado mining interests; the American Civil War had started. Yet, by April 3, 1861—nine days before Confederates fired on Fort Sumter—Gregory had returned to Colorado, having moved his family across the Georgia border to northern Alabama. It's likely that he also returned to Alabama for the 1861–1862 winter. It appears he was back in Colorado in the spring of 1862. But in early September a sheriff's summons was returned to plaintiffs; defendant John H. Gregory was nowhere to be found. As Southerners had become personae non grata in the mining towns, Gregory himself had been slurred in the pages of the Black Hawk Mining Journal. Not waiting for things to turn ugly, he left. Scott writes that Gregory and others made it through the lines of Union troops, yet never arrived in Alabama. One can't help but speculate that this canny John H. Gregory might actually have accomplished his return, in a clandestine rather than public manner. At some point, one of Gregory's fine golds, which would be labeled No. 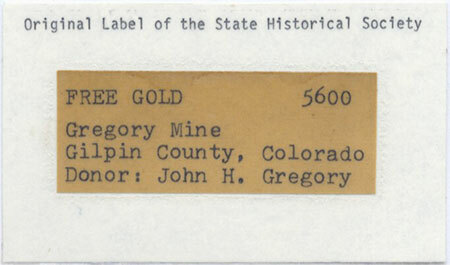 5600, came into the collection of the Colorado Bureau of Mines. Beginning in 1980, Richard Kosnar (Brian's late father), through whose collection The Colorado Dragon (then No. 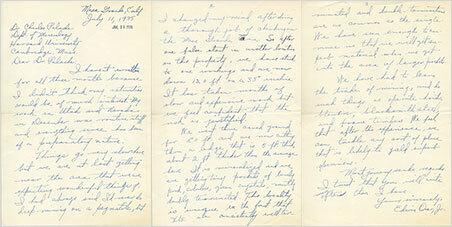 5600) would pass, began several trades with John M. Shannon, director of the museum at the Colorado School of Mines. Shannon had remarkable access to the museum's holdings, according to an article by the Rocky Mountain News, published on March 17, 1985, which stated that Shannon had assured Kosnar he'd received permission to sell the museum's specimens. 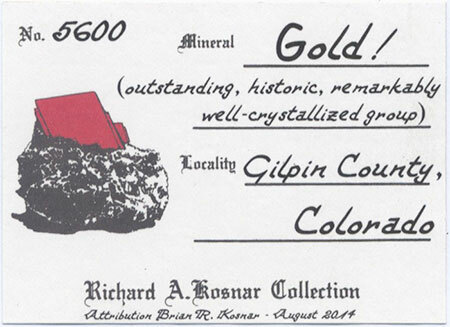 Kosnar told the Rocky that he obtained about 100 pieces from this collection, including a sponge gold from John Gregory's mine in Black Hawk. This was No. 5600, now dubbed The Colorado Dragon. According the Rocky, Shannon told Kosnar, "We don't need all these golds. We need the money." Via Kosnar, the article presented the situation through the eyes of private collectors and dealers, who consider it a feather in their cap to "liberate an unobtainable old classic from museums in exchange for contemporary material." Interestingly, the School of Mines geology museum has no record of this specimen ever being in its collection, the above label notwithstanding. 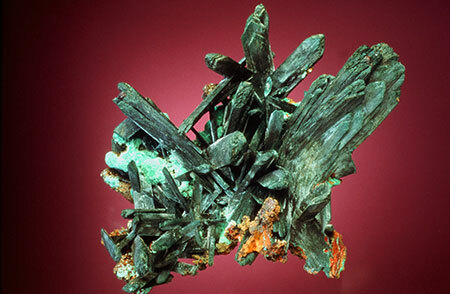 The School of Mines museum's other prominent collection consisted of 105 specimens of silver and gold given to the school by father-and-son Charles and Claude Boettcher in 1937. In the same way the Boettchers had come into possession of The Brown Palace Hotel, due to the 1929 misfortune of their partners in the venture, they obtained former Cripple Creek assayer Frank C. Allison's 35-year world-wide collection of silvers and golds when Allison fell on hard times in the '20s. The Boettchers also had a long association with what is now the Denver Museum of Nature and Science. Its Colorado Hall, dedicated in 1953 (now gone), was named after Charles, and this past summer the museum's new plaza adjoining its new wing was named Boettcher Plaza, for the family's foundation, which was launched the same year as the gift to Colorado School of Mines. At the Denver show last month, when we spoke with Brian Kosnar, he said that his father had offered to negotiate the return of No. 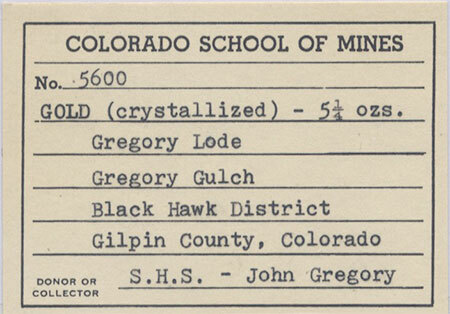 5600 to the School of Mines, but was assured that this transaction—while errant—had been legitimate. The family has enjoyed the specimen for 34 years, Brian said, making it somewhat easier to part with. And part with it he did. The gold was sold at the show to collector George Hickox, meaning that it will remain in Colorado for the foreseeable future. In profile, the specimen, with its legendary provenance, resembles a mythical creature: The Colorado Dragon. Above, the most recent label. Below, the list of institutions whose collections held the gold. "Prized Minerals Sold in Scheme to Boost Museum" and "Loss Made Worse by History, Beauty of Rare Specimens," Rocky Mountain News, 17 Mar 1985, 7–8, 42–43. "Noel: Gregory Lode Saved the Gold Rush," 19 Apr 2009, Denver Post, online. 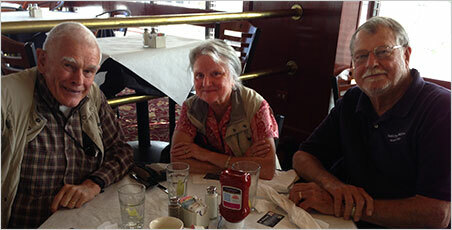 The John H. Gregory Legend, by Patsy Bradbury, n.d., online. 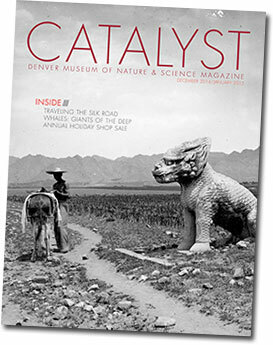 Annual Report for 1952 of the Denver Museum of Natural History, online. Denver Museum of Nature and Science Announces New Plaza Name, 17 Jul 2014, online. Edwin J. 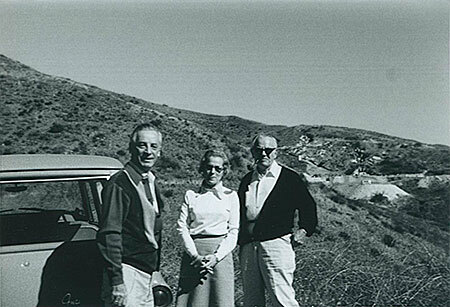 Over (1905–1963) was a mineral prospector and collector from Colorado Springs—"a legend as one of the great field collectors," says Pala International's Bill Larson. According to Over's Mineralogical Record biographical profile, he was trained at the Colorado School of Mines but did not obtain a degree. The training served him well, however, and he self-collected fine specimens in Colorado, Utah, Montana, Nevada, Alaska, New Mexico and Mexico. 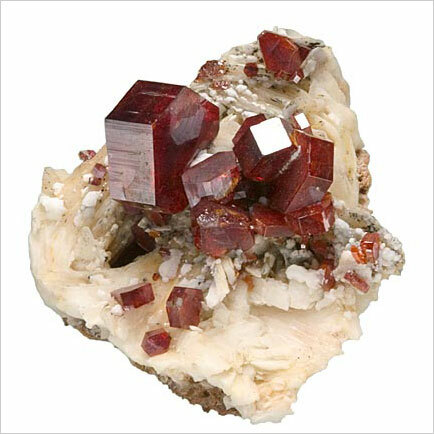 The red wulfenites that he collected at the Red Cloud Mine in Arizona are simply the finest. A 1939 photo of Over has him looking like Hamlet, a small boulder swapped for the braincase—as portrayed by James Garner (whom he did not otherwise resemble). It seems Over would have appreciated the Prince of Denmark's philosophical inclination. 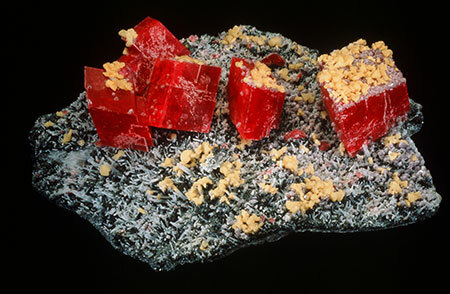 Himalaya Tourmaline Mine, Mesa Grande, San Diego County. "In working this ledge," G. F. Kunz wrote in 1905,* "pay material has been in sight continuously, and at no time has a barren piece of ground been encountered." 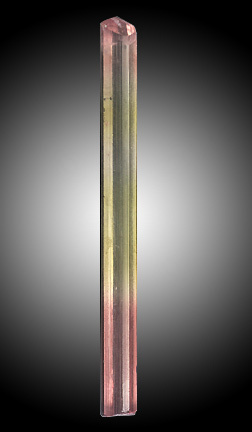 In 1904, six tons of rough tourmaline were shipped to the producer's New York lapidary; "of this amount, 300 or 400 pounds were fine nodules and pencils of the very highest grade," Kunz wrote. 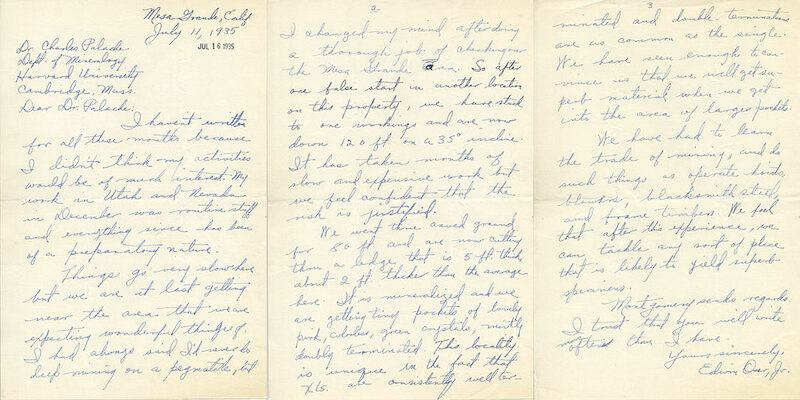 In the following letter from Over, written thirty years later in the summer of 1935, he is cautiously enthusiastic about mining in Mesa Grande. The letter is addressed to Charles Palache (1869–1954; see memorial), a professor of mineralogy at Harvard, described by a colleague as "one of the most eminent crystallographers and mineralogists of the world." *Kunz, G. F.. 1905. Gems, Jewelers' Materials and Ornamental Stones of California, issued as Bulletin No. 37 of the California State Mining Bureau, Second Edition, pp. 33, 55, 134, 135. Sacramento: Superintendent State Printing. I haven't written for all these months because I didn't think that my activities would be of much interest. My work in Utah and Nevada in December was routine stuff and everything since has been of a preparatory nature. Things go very slow here but we are at last getting near the area that we are expecting wonderful things of. I had always said I'd never do deep mining on a pegmatite, but I changed my mind after doing a thorough job of checking over the Mesa Grande area. So after one false start in another location on this property, we have stuck to one workings and are now down 120 ft. on a 35° incline. It has taken months of slow and expensive work but we feel confident that the risk is justified. Above, the letter from Edwin Over to Charles Palache (click to enlarge). 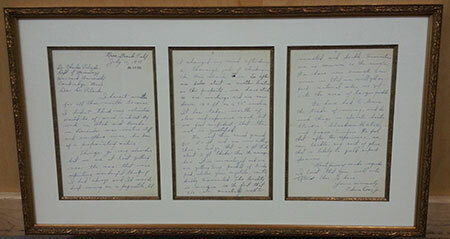 Below the letter, framed, at Pala International. We went thru caved ground for 80 ft. and are now cutting thru a ledge that is 5 ft. thick, about 2 ft. thicker than the average here. It is mineralized and we are getting tiny pockets of lovely pink, colorless, green crystals, mostly doubly terminated. This locality is unique in the fact that xls. are consistently well terminated and double-terminations are as common as the single. We have seen enough to convince us that we will get superb material when we get into the area of larger pockets. We have had to learn the trade of mining, and do such things as operate hoists, blowers, blacksmith steel, and frame timbers. 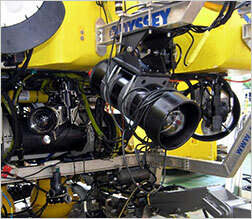 We feel that after this experience, we can tackle any sort of place that is likely to yield superb specimens. Montgomery [Arthur Montgomery* (1909–1999); see profile)] sends regards. I trust that you will write more often than I have. *Palache introduced Montgomery to Over, and the two became business partners. 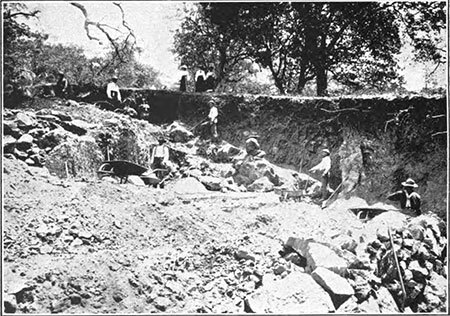 The sluice boxes, however, contained a large number of blue pebbles which, while no importance was attached to the find at the time, were subsequently identified by Messrs. Tiffany as sapphires of high grade and thus an enterprise which appeared to have culminated in an absolute loss, brought in the end substantial reward and led to the location of the lead from which the stones had become detached, and the development of an industry which during the quarter of a century of its existence has produced and placed on the markets of the world gems to the value of several millions of dollars. Read the full, nicely illustrated text here—if you have the patience. 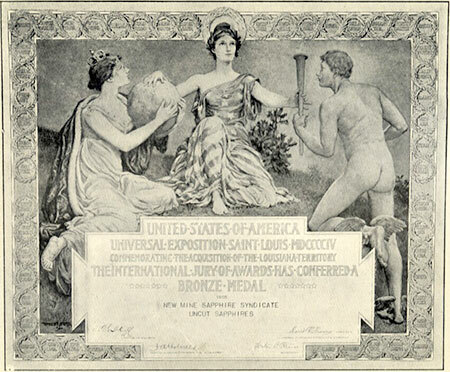 For its exhibit of uncut sapphires, the New Mine Sapphire Syndicate received the Bronze Medal at the St. Louis Universal Exposition of 1904. Solar Glower: Vanadium to the Rescue? 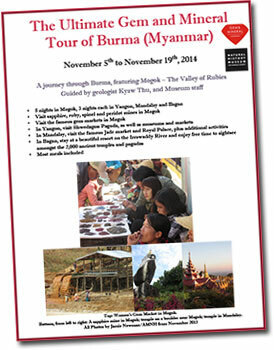 A seven-page brochure provides all the details for this fantastic opportunity. 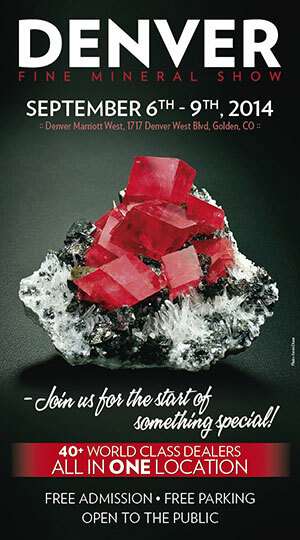 Pala International will exhibit at the inaugural Denver Fine Mineral Show in nearby Golden. We look forward to seeing our many friends there. 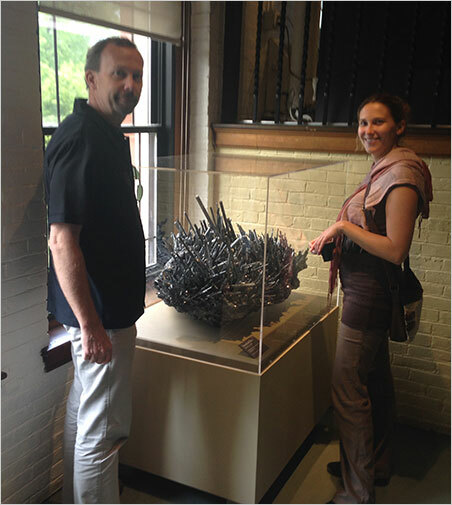 Pala people and fellow travelers happened to be on the East Coast earlier this summer just in time to catch the arrival at Harvard of the Swords of China, a ~400-pound stibnite specimen on loan to the university's Mineralogical and Geological Museum through June 2015. The specimen, one of the largest in the world, is one of only two on display in North America that feature its size and quality. (The other, pictured below, is in New York.) 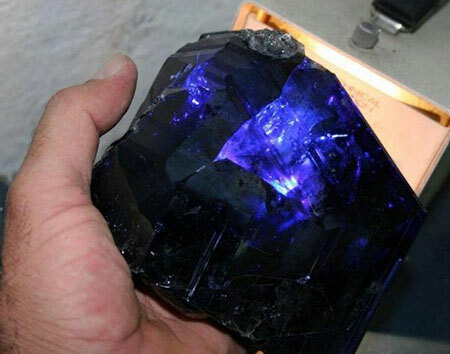 In 2003, it was discovered in the Wuning Mine of the Jiangxi Province in the southeast of the People's Republic of China. The remarkable discovery is described in a museum press release. Raquel Alonso-Perez, Curator of the Mineralogical and Geological Museum at Harvard University, said that in 2003, artisanal miners in China broke into a spectacular cave of stibnite crystals while mining for stibnite ore. 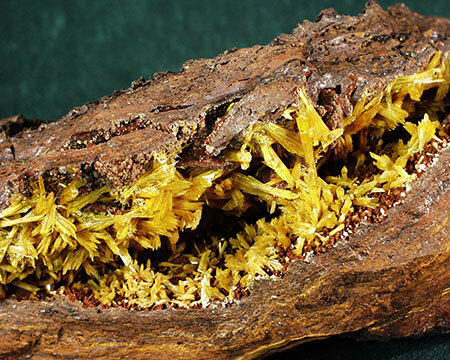 This was, and still is, the most important discovery of mineral specimens in the history of mining in China. Luckily at the time the miners were able to call in experienced local mineral dealers who were able to collect some of these giant specimens that are remarkably free of damage. 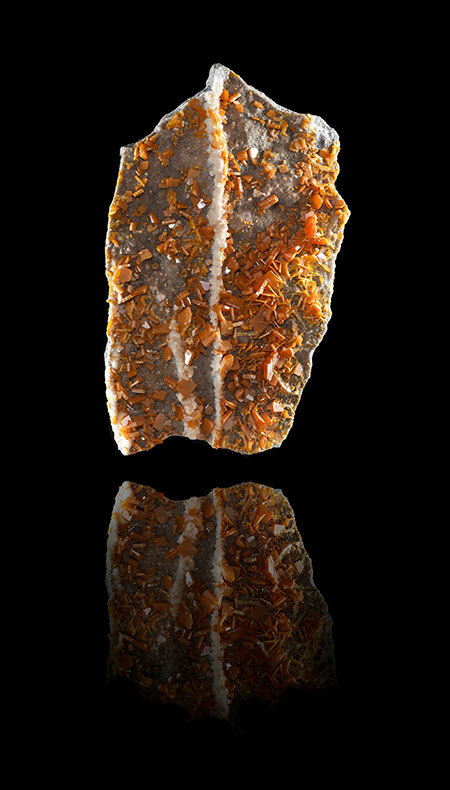 This specimen and the piece on display at the American Museum of Natural History in New York are the only two specimens of this size and quality on display in North America. 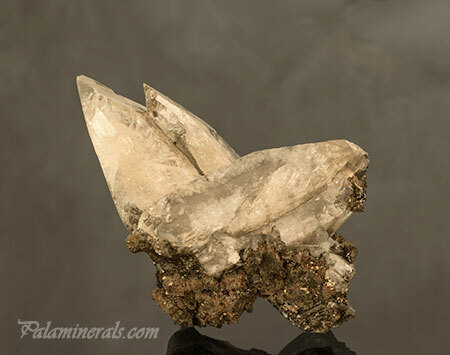 Only a few specimens of this one-meter size were found and they are now considered great treasures in the world of mineralogy and mineral collecting. Stibnite is the main ore of the element antimony, which can be used to make flame-retardants and engine bearings. In the ancient world stibnite was used to make silvery-gray cosmetics and in its refined elemental form was used to make colorless glass. Glass is naturally a blue-green color and the discovery of antimony as a de-colorizer was a pivotal moment in glass making history. 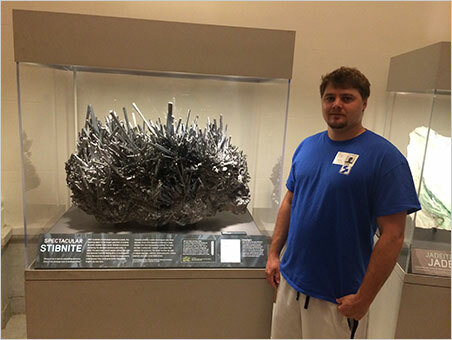 Besides the stibnite pictured above at the American Museum of Natural History (AMNH), also on display is a special exhibit of California gold. See below for a taste of the variety and quality available to visitors of the museum. 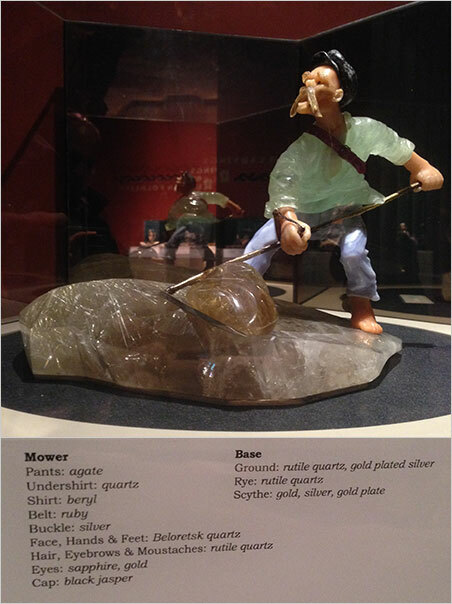 AMNH also houses fine examples of the lapidary arts, as the following carving demonstrates. Pink Lady. 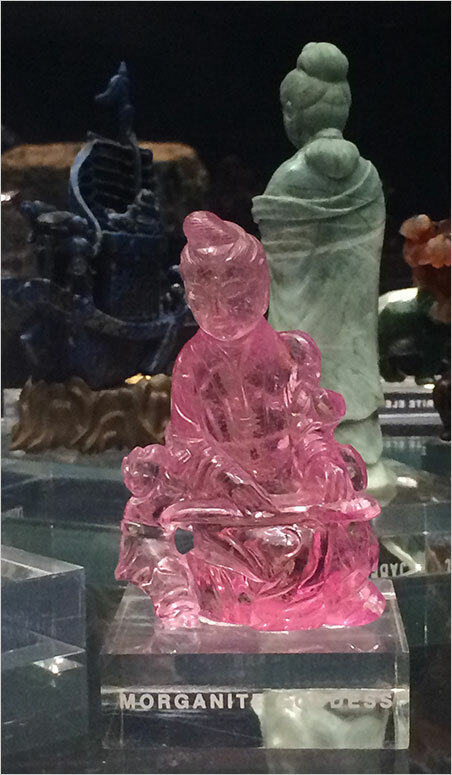 The Pala people fell in love with this goddess image carved from Madagascar morganite. In the December 6, 1910 edition of the New York Times, George F. Kunz, chair of the geological section of the New York Academy of Sciences, was quoted: "I have named [the mineral] after J. Pierpont Morgan, the distinguished financier, art lover, and philanthropist, in recognition of the encouragement he has always extended to the arts and sciences…. 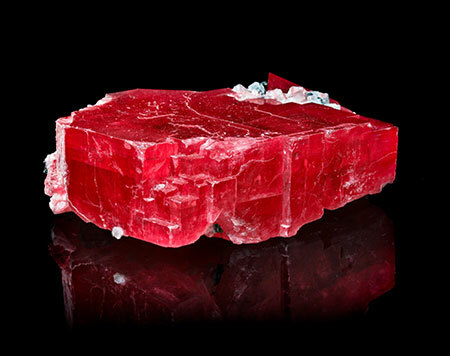 This gem, which was discovered in its perfection during the present year, differs from other beryls in that it fluoresces an intense cherry red when exposed to X-rays. … The color… is that of a true pink rose—a pure, clear color, with less of the magenta of even a pale tourmaline, lacking the lilac of the Kunzite. 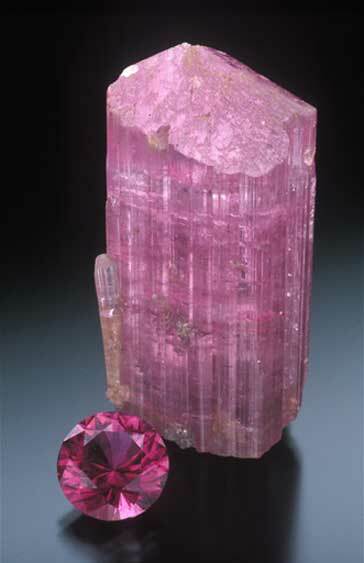 It is a warmer pink than the pale pink topaz, and is full of the purple of the darker pink topaz. It is not as vivid a gem as the pink topaz, and both pink topaz and pink spinel are never so large as this gem." AMNH's Morgan Memorial Hall of Gems also was named in J. P. Morgan's honor. 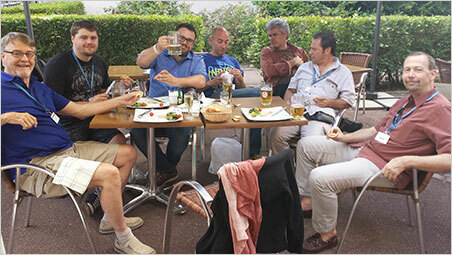 Pala International's Will Larson shares some of the highlights of this year's show whereby an Alsatian mountain township becomes an international playground for mineral enthusiasts. Sainte-Marie is always a blast! I'm sure everyone in the mineral community has heard us Larsons talk about how much we love the show, and every bit of it is true! The weather was great this year. Sometimes it is prone to thunderstorms, but luckily we avoided that and it was sunny most days of the show with a few clouds spread here and there. 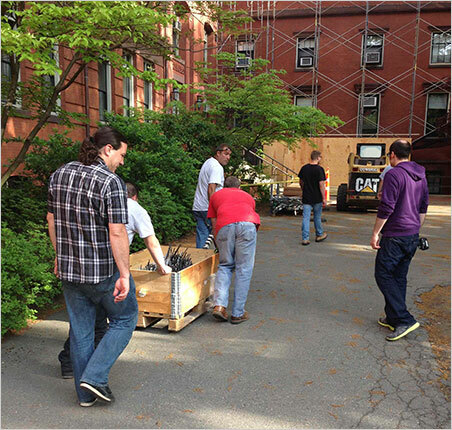 On setup day we were able to get in with our VIP badges and ascertain which new specimens might be lurking inside a box, behind a booth, or on a shelf. As we ran from booth to booth we found new fluorites from China, acanthites from Morocco and lovely little axinites from Pakistan. 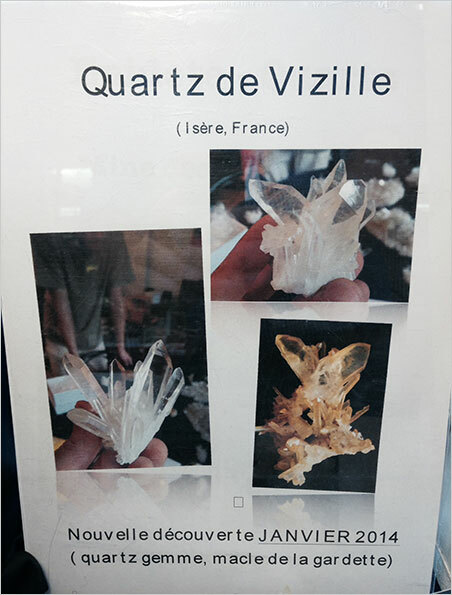 One of the more exciting discoveries for the French, though, was a brand new find of quartz specimens that had both Japan-law twins as well as beautiful clusters of crystals. These are from the Isère region, a different mine than the famous La Gardette but apparently very close by. The quartzes come out with a beautiful yellow coating which can be removed with basic cleaning but I think I prefer them with the yellow staining as one sees so much clear quartz these days on the market. This fine green beryl is from a find in Brazil dating back to the 1980s. The specimen is a beautiful cluster of doubly terminated beryls all with very fine luster and color. To have so many beryls together and in great shape is truly rare! 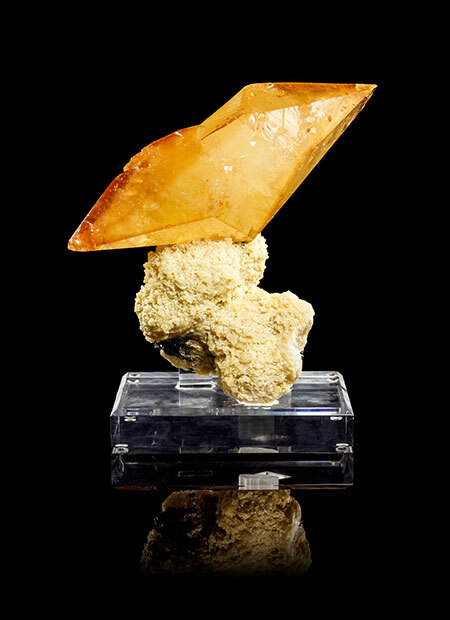 This specimen would do well in anyone's beryl collection or world-wide collection as well. Currently underway is an intensive, multidisciplinary endeavor to understand what's known as "deep carbon," i.e., the 90% of not-readily accessible carbon in our world. In 2009, more than a hundred scientists joined forces and subdivided efforts for a ten-year project to examine carbon in four key areas under the umbrella of the Deep Carbon Observatory (DCO). 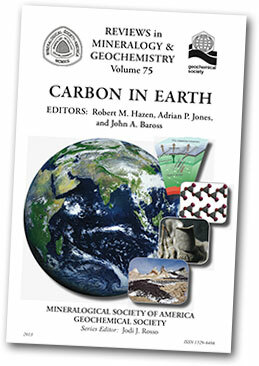 The group's first report of nearly 700 pages (plus video content) is being made available, gratis, via Volume 75 of Reviews in Mineralogy & Geochemistry, published by the Mineralogical Society of America, and entitled Carbon in Earth (downloadable at the MinSocAm website). DCO's tetrad of inquiry is summed up by the following, from the group's website. The Extreme Physics and Chemistry Community is concerned primarily with the most fundamental questions regarding how carbon interacts with other elements under the high temperature and pressure conditions of deep Earth. Scientists in the Reservoirs and Fluxes Community are asking how much carbon cycles into and out of Earth, for example during volcanic events, and analyzing diamonds and other carbon-containing minerals to document how much carbon is stored deep underground. The Deep Energy Community focuses on the many ways carbon compounds (such as hydrocarbons) are created, stored, and interact with Earth’s deep interior, and how organic molecules may have provided the raw materials for early life. And the Deep Life Community is on a quest to document the extreme limits and global extent of subsurface life in our planet. These Communities are not rigid divisions of the DCO, and cross-community research is commonplace, encouraged, and fostered within a flexible research framework. Chapter Two of Carbon in Earth's twenty chapters looks at the basics: Carbon mineralogy and crystal chemistry. And it discusses not just diamond, but a diverse array of carbonate mineral, neatly illustrated: the rhombohedral carbonates, the calcites, the dolomites, the aragonites, and more. The variety, according to the chapter's conclusions, leads to further query. "Among the most fundamental mineralogical questions—one evident from any museum display of carbonate minerals—is what physical, chemical, and biological processes lead to the remarkable range of calcite crystal forms?" Readers who want to, er, dig deeper are directed to eleven pages of references. Earlier this month, BBC reported on a dilemma facing the grids of sunny, power-hungry states like Hawaii and California. Consumers of electricity in the Aloha State pay more than three times the mainland average, so more than ten percent of its residents have installed solar panels. California is on tap to obtain 33 percent of electricity from renewables by 2021. There's a downside to this, however. Solar power is produced when the sun is at its most productive—between noon and 4 p.m.—creating a power glut. Problem is, peak demand is late afternoon and early evening, creating a mismatch. The problem is so great that in parts of Hawaii new solar panels are being banned, to keep circuits safe. So, what if the excess power could be saved for use at peak? 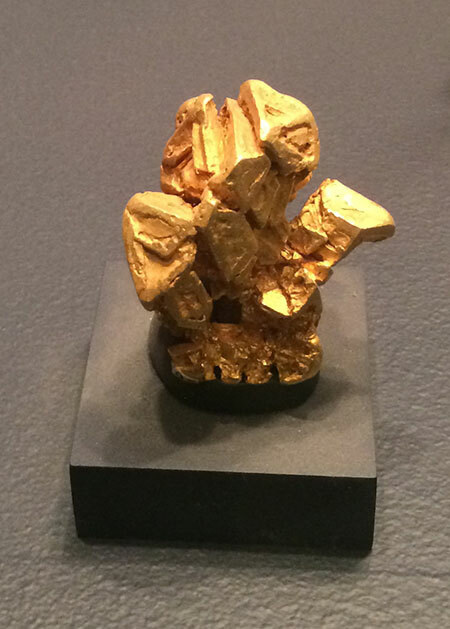 On the last day of May, mid-afternoon, a prized gold nugget weighing half a pound was stolen from the Flandrau Planetarium at the University of Arizona, according to a school crime alert. The nugget was part of the Hubert de Monmonier Collection. It is valued at $30,000 and measures 3.11 x 1.26 x .9 inches. It has not been recovered. Next door, in New Mexico, things went a little bit better after an April 9 theft. A 3-carat rough diamond was taken from an exhibit on volcanoes at the New Mexico Museum of Natural History and Science in Albuquerque. 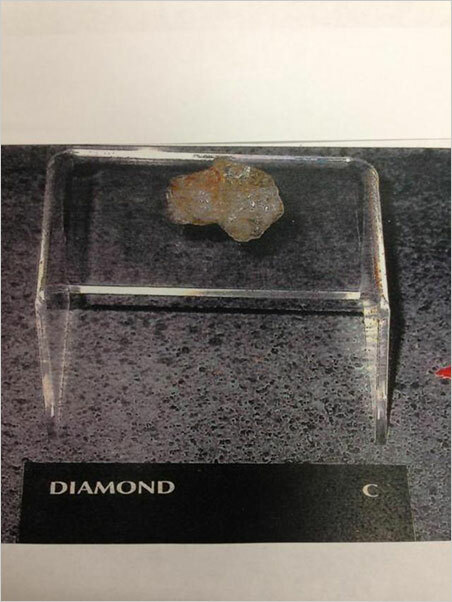 Just after the museum's opening at 9:00 a.m., the case housing the diamond was broken into; there was no alarm, according to a story in the Albuquerque Journal. To add insult to injury, the diamond was a loaner—having been lent for the past 28 years. The good news is that a local gem and mineral shop purchased the rough the same day as the theft, after it had been shopped around locally to other dealers. 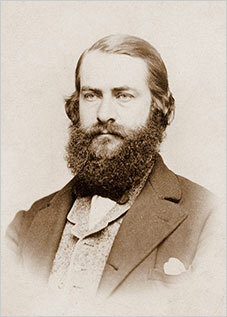 Joseph Leidy (1823–1891), a contemporary of and correspondent with Charles Darwin, has been called the pre-eminent scientist of his time. He was a pioneering American anatomist, best known as the father of American vertebrate paleontology, according to one profile. But his interests were not confined to biology, as is shown by "On Tourmalines," published in the proceedings of the Academy of Natural Sciences of Philadelphia in early 1882. Nor was Leidy's life-science interest limited to vertebrates. One account describes how Leidy, at a dinner party, was served from a tureen of terrapin turtles. Rather than dine on the delicacy, he decided to dissect it. In 1888, six years after taking his fellow scientists through his tourmaline collection, Leidy published "Entozoa of the Terrapin," regarding the turtles' parasites, in the proceedings of the Academy of Natural Sciences, of which he was a founding member. This article focuses on the gemstone carvings from the Cafesjian Collection. To view images of the carvings, see our July gemstone newsletter. 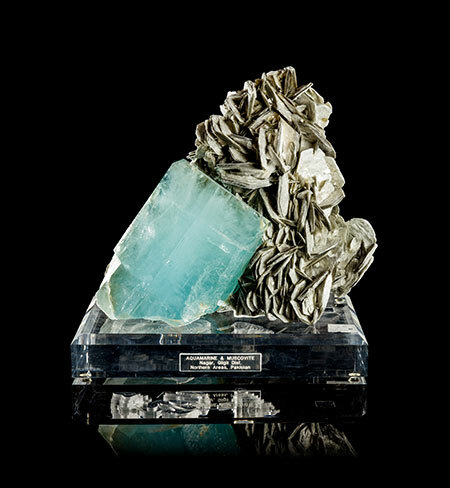 Attendees of the Denver Gem & Mineral Show, September 12–14, 2014 will have a chance to preview impressive gemstone carvings and mineral specimens from the collection of the late Gerard L. Cafesjian, prior to their sale on September 16. Cafesjian, who passed away in September 2013, gathered hundreds of of objects in a collection that included fine art, jewelry, gems and mineral specimens. According to a July 6 story in the Denver Post, a portion of the fine art now resides in the Cafesjian Center for the Arts in Yerevan, west central Armenia. More than 900 items of jewelry from the collection were auctioned in April at Leslie Hindman Auctioneers in Chicago. The September 16 sale will consist of more than 700 pieces of carvings and mineral specimens. Interested parties are welcome to contact Leslie Hindman Auctioneers for preview appointments from August 11–September 15, and the public preview will be open September 1–16. Providing background on the collection, Alexander Eblen, Director of Natural History at the auction house, told us, "Mr. Cafesjian's passion for color and whimsy was first embodied in a world-class assemblage of art glass including many works by his good friend Dale Chihuly." Coincidentally, Chihuly's work currently is on display—al fresco—at the Denver Botanic Gardens through November 30. "Over time," Eblen continued, "this fascination with contrasting colors and unusual forms led to an interest in the Natural History world." Offered in the sale will be dozens of fine lapidary art carvings by Idar-Oberstein masters such as Gerd Dreher, Manfred Wild, Gerhard Becker and others. But the sale won't be limited to carvings and specimens, Eblen told us. "The auction fully encompasses the decorative arts, including intricate stone inlaid boxes and tables, various polished stone objects and sculptures by leading contemporary artists." The provenance of almost every object is documented, Eblen said, "and the property will be offered at very conservative prices to entice bidding." The lots will be available for view at the Leslie Hindman Auctioneers website closer to the time of the September 16 sale, which is the firm's inaugural Natural History auction. Pala International has a personal connection with this collection, having once owned the citrine lion carving pictured here. 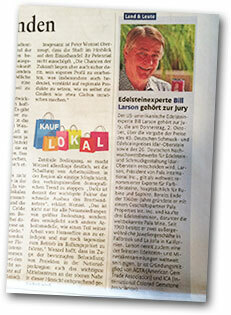 Says Pala's Bill Larson, "We bought the citrine rough in Brazil and commissioned Gerhard Becker to carve it."